The National Association of Home Builders (NAHB) helps its members build communities. Each year, NAHB’s members construct about 80% of the new homes built in the United States, both single-family and multifamily. A federation of more than 700 state and local associations, NAHB represents more than 140,000 members. NAHB created the Defender of Housing Award on behalf of the more than 700 state and local HBAs across the country that make up the NAHB Federation. These HBAs chose their nominees, and a panel of NAHB elected leaders chose the finalists. 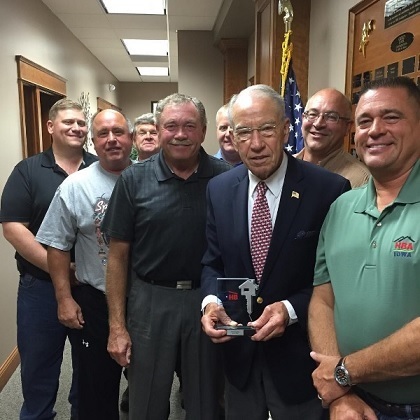 Grassley has been a leading advocate for tax relief, congressional oversight of unnecessary federal red tape and a champion for regulatory relief for small businesses. As a senior member of the Finance Committee, Grassley introduced the Small Business Health Care Relief Act, bipartisan legislation allowing small businesses to resume helping their employees buy individual health insurance, easing a counterproductive Obamacare rule that has harmed small businesses and employees across the country. Grassley has also been one of the strongest voices of opposition to the Environmental Protection Agency’s ill-conceived Waters of the U.S. (WOTUS) rule, which would define 97 percent of the land in Iowa as a waterway and subject it to federal regulation. This impractical rule and clear example of federal overreach has the potential to unnecessarily financially burden home builders and construction companies in Iowa.